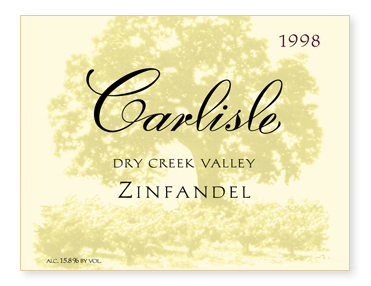 From our Dry Creek Valley source, 109 year-old vines and low yields combined to produce some very ripe zinfandel in 1998. Excited by the intense fruit flavors but concerned that the elevated sugar levels could cause a problematic fermentation, we also picked some flavorful, though less ripe, petite sirah from an adjacent block and did a "field blend" in the fermentor. The decision paid off and after a long, moderate fermentation, the wine finished dry.